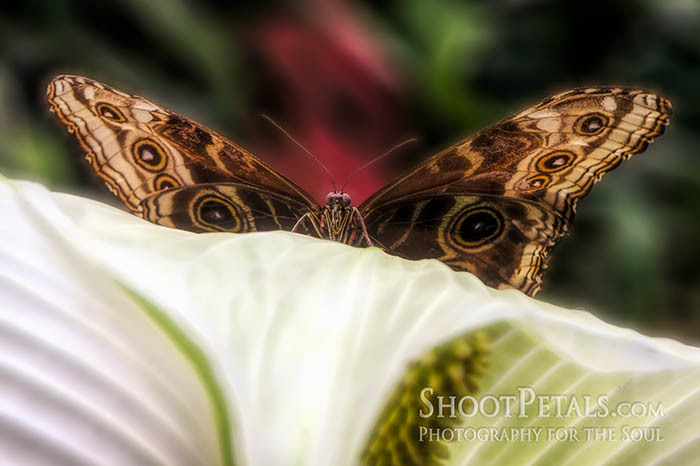 Victoria Butterfly Gardens is a photographer's flying flower fantasy. The path that leads through Victoria Butterfly Gardens is a hike through the life cycle of one of nature's most fascinating creatures. Corral hundreds or thousands into a controlled garden space and you've got the perfect set-up for a fiesta of butterfly photography . Blue Morpho butterfly on white calla lily at Victoria Butterfly Gardens, Victoria, BC. Edited in Topaz. Be forewarned, as far as models go, 'flutter-bys' aren't very obliging! .... mostly because we're out to photograph them during the brightest part of the day when they're bursting with energy. 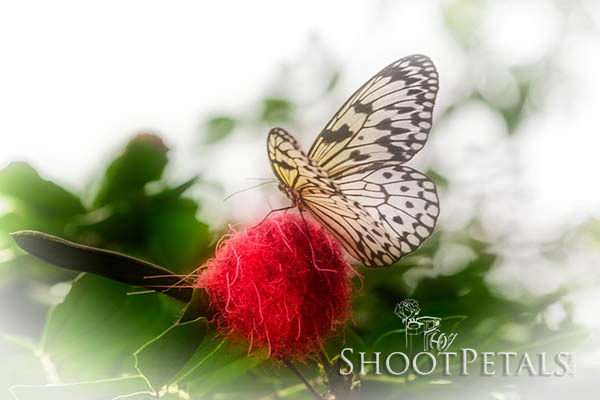 Prepare - review these butterfly photography tips... the more you know about them, the better you'll be able to net some quality photos! Use Video When They're Too Active! When the little critters won't stay still for two seconds, switch to video. My stress level's way down now that I shoot video. Now it's a sure thing to come away with either still photos or video.... both, with a bit of luck! Large Tree Nymph on a deep pink Powder Puff bloom. White vignette highlights the blossom and butterfly. You'll need a tripod for sure (for both your video and your SLR). When you shoot video, "map" out the story you want to tell. Make drawings or notes of everything you need to shoot. All the same rules of composition apply. Need a refresher? Start here. Make sure your scenes are good before you leave. Nothing is more depressing than realizing the footage is crap and you're half way around the world! Ask me, I know! I put together 3 different videos from my two visits to Victoria Butterfly Gardens. Once in the summer and once in winter. The Emerging Room where the metamorphoses begin! Summer ... Of course, it was tourist season and really crowded. Winter ... So much more relaxed with only a few other visitors. It's hot and humid inside…. remember, it's the Jungle! And humidity is your camera's worst nightmare. When you take your camera out of the case, it's going to fog up... For a long time! Awfully nice of 'em. .. they installed a hot air dryer right on the wall beside the exit door and the emerging room. Use it! Warm up your camera and lens. It only takes a minute, then you're off and shooting. Everything in the Emerging Room is in slow motion... not like in the jungle garden! So you might want to point your camera in that direction while the butterflies dry their wings. The only challenge to getting some good shots is the reflections in the glass window so you'll need a polarizing lens. You may need to change your angle to stop the reflections. Just keep moving until you find the best "clear" spot. Your best bet is to make a quick round without photographing anything. If you have time, go through slowly, pay attention to every detail. Make lots of notes. Take pictures of all the signs. You'll forget interesting details if you don't! Look for inspiration in wing patterns, tortoise shells, curves and lines. We're talkin' composition! The Summer Visit video begins with the Giant Owl butterfly. A super up-close and personal view of the top and bottom side of his wings... they're very different. The eye spots are a defense strategy that might fool predators.... and, sometimes they do and sometimes they don't! The water's full of Koi fish and a turtles who loves his basking log. The long, fuzzy pink flowers are Pink Chenille that the Large Tree Nymphs feed on. When you come to the "Jewels of the Rainforest", there's a chameleon... yes, he's really there. Blends right in... that's why he's called a chameleon! Ya, I had a hard time picking him out, too. Thankfully, the poison dart frogs are behind glass... tiny but mighty! Their brilliant colours scream "Back off buster!" Amazing iridescent colours. Since they're in a class house, use your polarizing lens again. It's hard to judge the size of the Atlas moth and his cocoon... really large! I was a lucky sod to see this fellow... largest moth in the whole wide world. Short-lived, only 3-5 days. They can cocoon for up to 5 years! That's a really long time without a meal... I couldn't do it. Like I said, I was so lucky he waited for me! Summer at Victoria Butterfly Garden is crowded and I only stayed a couple of hours. Not the best for scoping out the place and creating a plan. I confess, this time I grabbed all the video I could and then did a round with my DSLR. Not the best but that's life in the real world! And researching the gardens on the web beforehand got me a head-start. MODEL RELEASES: I get photos and video with children and their parents but I don't use them for my website. Unless you get written releases from parents, don't put children's images on the web. Don't use video or photos with recognizable faces unless you have a model release. Stock photography companies won't accept a submission without one. Also, some buildings need property releases. Google can help you find out if your photo is good to go on the web or if you should just keep it to yourself. Meet the Scarlet Mormon. The original file has dark foliage but it distracted from the butterfly. Making the background lighter makes the black, white and red pop. Our eyes look for things that are in focus. 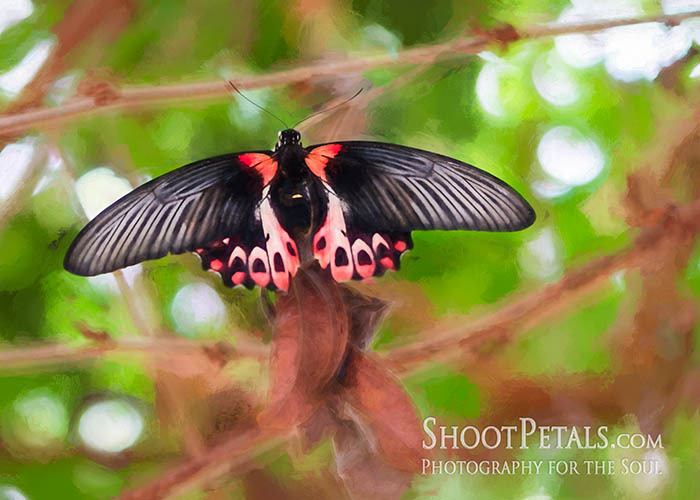 Since the background is blurred and the butterfly is in sharp focus, we look at the Scarlet Mormon. Scarlet Mormon, Butterfly Gardens in Victoria, BC. Edited in Photoshop and Impression. A Large Tree Nymph on a Pink Powder Puff flower... perfect name, huh? The original photo has too much contrast. The light was too bright near the skylight and the tree was in too much shadow. It was nearly 4:30 at Victoria Butterfly Gardens... since it was winter it was already turning dusky. I used Topaz Impression to turn this photo into a painterly image. And the filter brought down the high contrast colours. Some advice if you love photo editing and you've got Adobe Lightroom or Photoshop under control, take the plunge and spring for another creative editing program like ON1 or Topaz. If you like painting, there's also Corel Painter. There's lots of information on basic composition here, if you want to study up, start here and work your way through. Here's a challenge - look over the photos on this page and list as many of the "rules" as you can see in each image. It's good practice to critique other people's work. leading lines - the wings make angles and draw your eye along the outside edges. The butterfly sat still for a long time and there was no stress at all getting several photos out of him. This poor fellow was "battle scarred". His wings were damaged. But the peaceful butterfly on this gorgeous white Peace Lily was just too good and torn wings or not, he absolutely needed his picture taken! The most dramatic part of the photo is the sensual lines of the lily across the photo. 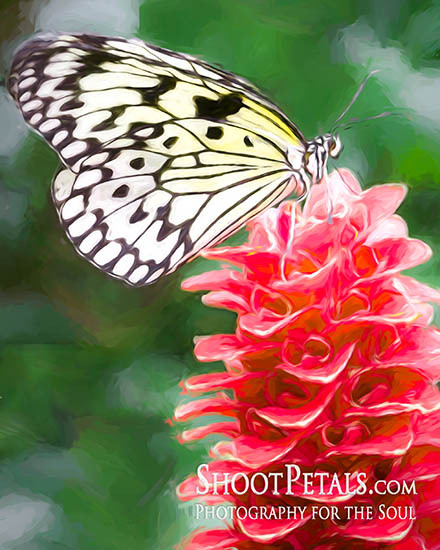 The size of the petals dwarfs the butterfly but doesn't make it any less important. The Butterfly ... More than just a beautiful bug! The Aztecs believe that when we die, our souls become butterflies. If that's true.... and I think it might be.... you'll be gazing through the camera lens into the souls of our ancestors right here in this garden. It's comforting to think our ancestors still live among us.... to guide us while they inhabit the earthly bodies of such beautiful and delicate creatures. I wonder how many souls are here in Victoria Butterfly Gardens? In the Christian religion, the butterfly is the symbol of transformation and resurrection. Jesus died on the cross and the caterpillar also "dies" (though both are destined to return to life). Then Jesus is entombed in a cave. The chrysalis is the "tomb" that holds the tiny transforming life. After 3 days, Jesus is reborn and leaves the cave. The butterfly also is "reborn" in a new form and emerges from his chrysalis. Butterflies have been depicted in ancient tombs and early Christian paintings. They appear in Ancient Greek mythology and Asian and Aztec cultures. More than just resurrection and transformation, they signify celebration and the souls of who are no longer on earth in human form. So, the butterfly's a message for us... keep your faith strong while going through life's difficult challenges and transitions. At the end of the process, you'll be miraculously transformed for the better. If you'd like another go-around the Jungle Garden, here's the final video from my February 2013 visit. Let's start with the pond life. Not everybody appreciates being a landing strip for butterflies.., the flamingos seem a wee bit annoyed! The three turtles are chillin' out on the log. I call the scene the "Battle for the Hibiscus"! This Large Tree Nymph really settled in and didn't want to share! But the Crimson Mormons keep on trying. You'll come across several hanging feeders and they're a good place to get photos. Bananas are a favourite for Giants Owls, there's a Blue Morpho and a Brown Clipper. They also put oranges in the feeders. The Giant Owls' furry bodies and weird eyes are fascinating. They're like strange little teddy bears. The still image was shot with a macro lens. The Crimson Mormons flutter their wings almost as fast and furious as a humming bird... they were impossible to photograph. Here at Victoria Butterfly Gardens you'll find sweet little finches, lots of song birds… and other birds. If Leo, the Orange Winged Amazon Parrot, is in a talking mood, he can get EXTREMELY loud. If you want good bird photos, you'll get a great selection at the Victoria Butterfly Gardens! These huge tortoises are definitely slow motion … and they seem to have hearty appetites. Their shells are amazing and you could get some fabulous close up shots of the patterns and textures. I totally missed that opportunity! Lots of seats around Victoria Butterfly Gardens and the butterflies will come and flit around you… sometimes even land on you. Wear a bright colour like a flower and your chances improve. But don't touch them... the scales on their wings are so delicate. The Buddha is at the end of the pathway. Pause and listen to the water before you leave. And then it's a wrap, full circle once around our Victoria Butterfly Gardens. Hot and sweaty by now... the Victoria Butterfly Gardens gift shop's the place to revive and cool off. And you really should pick up a few gifts and souvenirs. 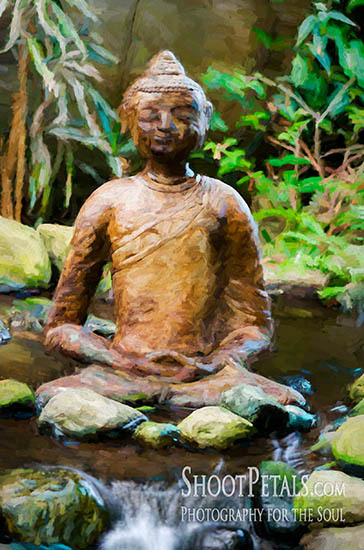 Buddha sits in a little creek near the exit. So before you go into the gift shop to pick up a souvenir or two, stop and admire him in his meditation. He's saying "farewell and please come back and visit the Victoria Butterfly Gardens again." Visit their website before you plan your stop-over. I can't recommend this day trip enough. Spend at least half a day with these heavenly creatures. Take a complete trip around first and make notes about what you want to photograph. Even though it covers a small amount of space, there's lots to see and the way the path is laid out, it feels much larger than it is. When you've come back to the start, take out your camera and make put it under the dryer to clear the lens. Then, off you go to get your photographs and have a "flutterography" time!